The media, US mainstream corporate national media, is not just bias, but manipulates information according to their will, most often in the name of sensationalism, rather than journalism, which according to them makes the news. I would like to see a reputable source to perform a national survey on that subject. I think people would rather have accurate news and news reporting that does not just provide criminals the headlines. It won’t happen because corporate media moguls want, like our present government, to take away firearms from lawful citizens in the false assumption that it will reduce crime. This report is about Rep. Matt Salmon, a Arizona Republican’s son who is a homosexual. He was to have an interview on Sunday for both networks: MSNBC [The Last Word with Lawrence O’Donnell] and CNN [Piers Morgan Live], but as reported to and by KPNX-TV those Sunday shows’ interviews were cancelled. Matt R. Salmon, the son, stated that it was because he refused to attack his father on the air. He stated it was because they had intended to be critical of him and … I was unwilling to do so. He stated that CNN seemed very gung-ho about an interview, but when he showed support of his father, they seemed to lose interest. This isn’t accurate. The show simply booked up with other guests on a different topic. Happens all the time in cable news. As Piers Morgan stated at least 104,000 people [at that time] wanted Piers Morgan deported. The petition was submitted to White House website, but Obama refused to even consider it, of course. How could Obama, when Morgan agrees with everything he does and supports him even though he has accomplished nothing positive or constructive in his first four years? People are saying Piers Morgan has constitutional right under First Amendment, but I do not believe he is a citizen, only foreign person working for CNN. Cha Cha researched and states: No, not an US citizen. He did have problems, initially with his work visa. True, Alex Jones got bent out of shape [to say the least], but he is tired of politicians and people like Piers Morgan constantly attacking our rights and liberties. I think Piers Morgan should have been allowed to make his point and counter with statistics; instead of Alex Jones losing it. One thing Piers Morgan should know that there are more people in US than UK, therefore numbers of all statistics would be more. 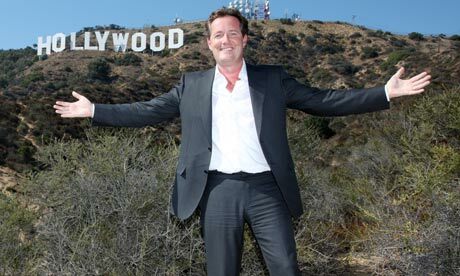 Alex should have let Piers have stated what he wanted to say and work from there. The reason why I showed this is that Americans are completely tired of defending rights clearly described in the Constitution of the United States – worse that it is occurring by elected Americans who dishonor their oaths of office. I think you can agree that Newt presented the truth of those who promote gun control and who want it – to disarm citizens, not criminals, and especially not government officials. Today, semiautomatic, tomorrow what else will be banned or permitted to be used? Progressive socialists love to mix apples and oranges. One deranged person out of millions who own and use firearms gives government permission to take away firearms from lawful citizens? Piers Morgan uses Chicago as an example of gun violence, a place where lawful citizens are not allowed to “keep and bear” arms and criminals, mostly gangs, use what they please. There are places in Chicago [and elsewhere in US] that are actually afraid to enter. This is what Morgan and others like him will create, eventually giving excuse of a police state. No government can “permit” rights and liberties under natural law. Morgan does not see the difference between automatic and semiautomatic, the previous being conceded by Americans that should be owned only by special permit. Those who are operating our government against constitutional law are a serious problem, but corporate media, their mouthpiece, is equally dangerous. The next video is with Sheriff David Clarke on the Guns in America program with Piers Morgan. He advised people to protect themselves, especially since police have difficulty arriving on time. While the Milwaukee Police Chief sided with Obama and Feinstein, a law enforcement official with growing crime rate because of several factors, the major one that the Mexican drug cartel has moved there. Wisconsin is known to be a sanctuary state for Mexican illegal immigrants, thus easily inviting the drug cartel to organize their efforts to spread into the United States. Once it was a problem mostly in California with its lax laws and non-enforcement of illegal immigration, but now spreading across the United States. This same government is telling Americans they do not need to protect themselves and that the Second Amendment protects rights to hunt, instead of defense against criminals and government tyranny, either foreign or domestic – because it is their job to protect us! The county sheriff has long been the protector of people within their county and most believed they were the prime enforcement and protection of the People’s constitutional rights. Thus the Constitutional Sheriff’s Association was established because of growing unconstitutional growth and intrusion by the federal government who choses what laws they will enforce and what they will not enforce. Notice that the mayor complains about something that is responsibility of legislation by not allowing people with restraining orders and mental problems to purchase firearms. Notice that both Piers and Mayor interrupted him, even when he was answering the question – because it wasn’t what the Mayor or Morgan wanted to hear in order to make the point that the Second Amendment does not matter when government decides it not “permitted” or “appropriate”. The next video shows up Piers Morgan and his ilk that constantly preach against “big money”, when in fact wealthy moguls, most famously by notorious George Soros, support the Democratic [Socialist] Party. Newt also should have used JFK’s tax cuts as ammunition against Obama failure. The point here is media sides with socialism, mouthpiece of political nonsense, instead of the eyes and ears of the People, which should be the sole purpose of journalism. Isn’t it ironic what Piers Morgan calls “discussion”? Piers Morgan represents what is wrong with modern media. No one is saying, Mr. Cooper that Sandy Hook tragedy did not happen, but what about those shady areas concerning “facts” so eagerly used by the Obama regime? Notice that Cooper relies on emotion instead of facts, just like Obama and company. This entry was posted in 2nd Amendment, Bill of Rights, Constitutional Crisis, From My Desk, Media Bias, Media Manipulation, Media Misinformation, Media Watch, Video and tagged CNN, Corporate Media, Media Manipulation, Piers Morgan.